Flounder are large, flat fish found on the bottom of saltwater locations around the United States. A type of white fish, they contain very little fat and no carbohydrates. Instead, flounder is relatively protein-rich and contains some beneficial minerals. Though an 8 oz. serving of fish is a fairly large portion, this amount provides rather low levels of nutrition. Flounder contains over 80 percent water, reducing the overall nutritional content of the fish. An 8 oz. 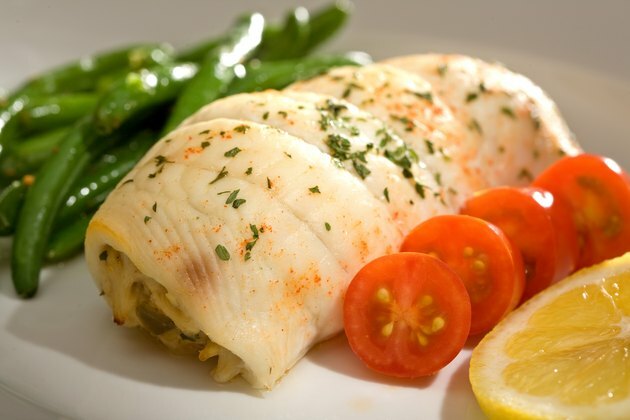 piece of cooked flounder contains 183 calories, according to the USDA National Nutrient Database. That makes it a relatively low-energy food per serving. The average 175 lb. moderately active man needs around 2,800 calories per day, and the average 125 lb. woman 2,000 calories. An 8 oz. serving of flounder makes up only 6.5 percent of an average man's daily calorie intake and 9 percent of a woman's. Aside from water, protein is the most abundant substance in flounder. An 8 oz. piece delivers over 32 g of protein. Flounder protein is classed as "complete"; it contains the full range of essential amino acids, with leucine and lysine found in the highest doses. Flounder is also a very lean source of protein. The fish contains just 5 g of fat per 8 oz., or under 2 percent fat. Only 1.2 g of this is saturated fat, a type linked with poor heart health. Flounder contains a range of minerals and vitamins, many in small amounts. The fish has no vitamin C and low levels of calcium and iron -- three important dietary substances. However, some flounder contains fairly high levels of sodium, as much as 771 mg per 8 oz. That's almost a third of your recommended 2,300 mg maximum per day. To boost the vitamin C, iron and calcium content of a meal involving flounder, try serving the fish with low-fat cream sauce and spinach. The addition of dairy and dark green vegetables increases the calcium, iron and vitamin C.
Flounder contains lower amounts of fish oils -- and, hence, less omega-3 fatty acid -- than some other fish do, such as salmon and mackerel. For example, an 8 oz. serving of cooked mackerel contains a total of 2.7 g of the three important omega-3 fatty acids EPA, DPA and DHA. The same serving of flounder offers only 0.8 g of the same fatty acids. These substances may help lower the amount of cholesterol in the blood and help keep your heart and circulation system in good condition. Harvard Family Health Guide: Good Nutrition: Should Guidelines Differ for Men and Women?